Travel light. That is good advice for most travelers but maybe even more so for those who might have to carry their belongings a long distance, such as campers. But with the Burch Combination Bed Sheet, Tent and Sleeping Bag, it’s all-in-one. That is how this circa 1908 trade catalog by F. J. Burch & Co. begins. 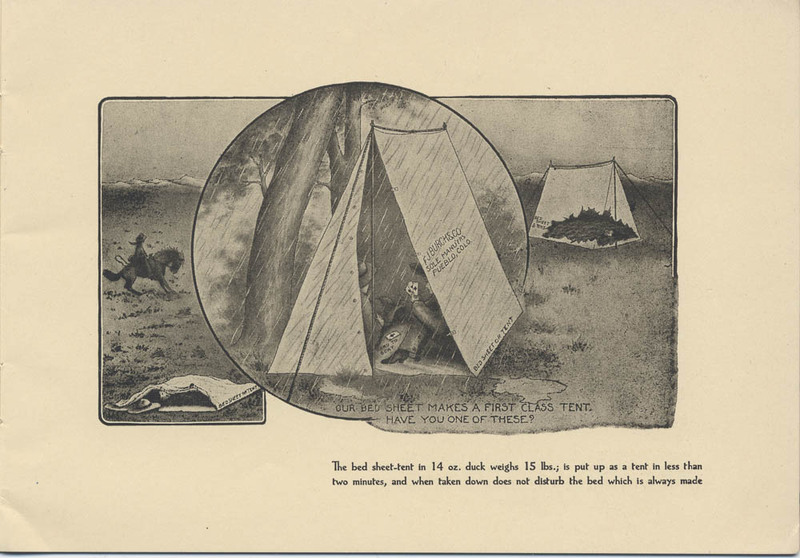 The first page shows the Burch Combination Bed Sheet, Tent and Sleeping Bag as a wall tent, a wedge tent, all rolled up, and a sleeping bag. The catalog then goes on to describe each of its three features. F. J. Burch & Co., Pueblo, CO. Burch Combination Bed Sheet Tent and Sleeping Bag, ca. 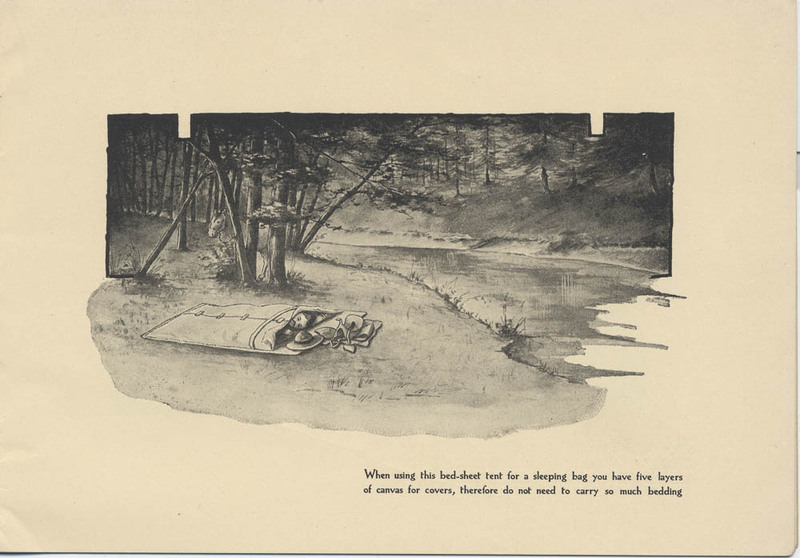 1908, Burch Combination Bed Sheet, Tent and Sleeping Bag at a campsite in the rain. But then, “in less than two minutes time one can change the sheet into a wedge tent with a solid canvas floor, which affords a perfect ground protection, the ends closing up absolutely tight, underlapping the floor eight inches, thereby protecting the user from the smallest bugs and reptiles.” And a tent is made! F. J. Burch & Co., Pueblo, CO. Burch Combination Bed Sheet Tent and Sleeping Bag, ca. 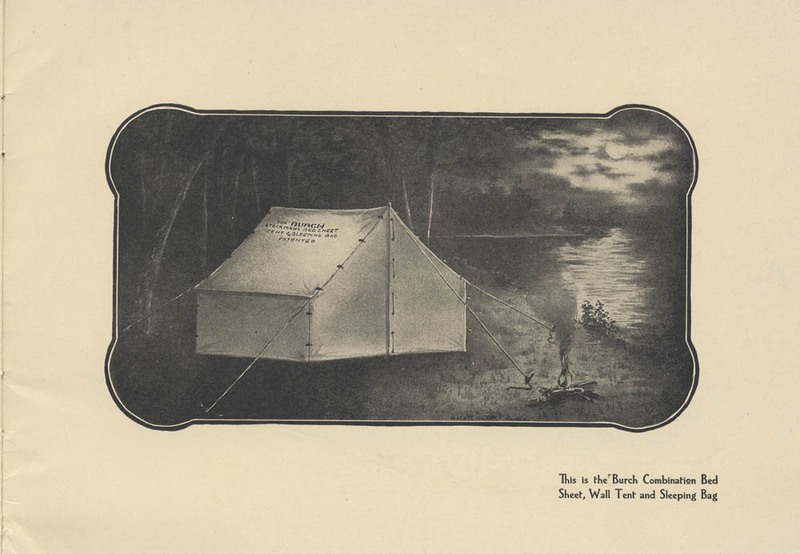 1908, wedge tent feature of the Burch Combination Bed Sheet, Tent and Sleeping Bag. A small flap near the top of the tent is used for ventilation. The ridge at the top of the tent is a rope which can also be used to hang clothes inside the tent. There are also two pockets on either end of the tent for campers to store small personal belongings. But, wait! It can also be turned into a sleeping bag “by laying the sheet out flat on the ground and bringing the two ends together, folding the sides over and snapping the same together in the middle.” The sleeping bag measures three feet six inches wide by eight feet six inches deep. F. J. Burch & Co., Pueblo, CO. Burch Combination Bed Sheet Tent and Sleeping Bag, ca. 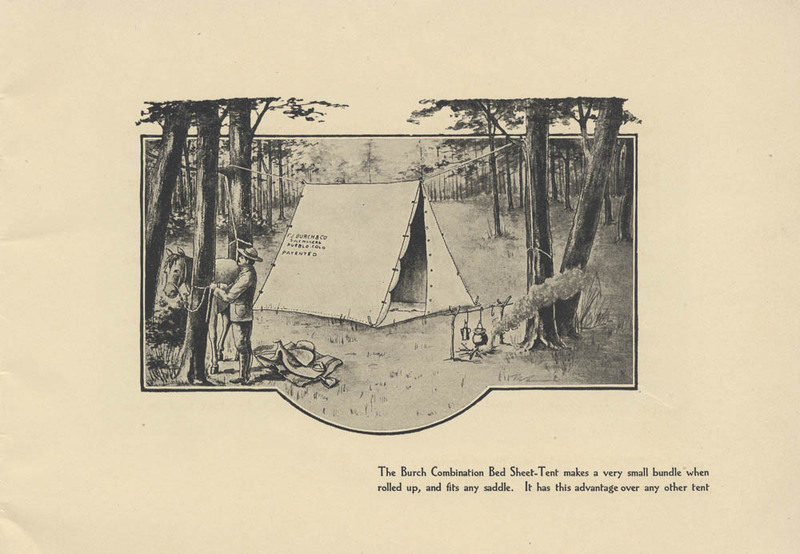 1908, sleeping bag feature of Burch Combination Bed Sheet, Tent and Sleeping Bag. 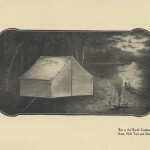 When all rolled up, the Burch Combination Bed Sheet, Tent and Sleeping Bag, including poles, measures twenty-four inches long and eight inches in diameter. It weighs about fourteen pounds, depending on the type of material used. This circa 1908 trade catalog by F. J. Burch & Co. is located in the Trade Literature Collection at the National Museum of American History Library. Take a look at Galaxy of Images to see more pages from this catalog, including testimonials of users. F. J. Burch & Co.
Next Post America’s Family Album & Smithsonian Libraries!